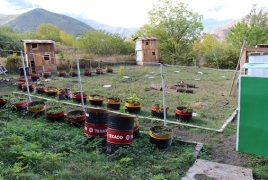 Foreigners account for the majority of those visiting the eco-camps in Kapan and the village of Arajadzor. The camps house permaculture gardens where the travelers and volunteers can cultivate and enjoy the herbs and fruits they have grown themselves. The tents are made from recycled raw materials, with those behind the initiative have also mapping mountain climbing routes with a length of 100km. Also, the camp helps tackle the issue of employment in the community. The profits, meanwhile, are spent to renovate community attractions, infrastructures, as well as implement educational projects about organic agriculture among the locals. According to Siranush, the lack of provincial infrastructures is one of the biggest obstacles to engaging in social entrepreneurship in the country’s south, and the situation is further complicated by the shortage of of specialists, especially in the field of marketing. “This model of business is easily accepted by the society. We are happy to unveil Armenia’s biggest wealth - a.k.a nature - to the world on the one hand, and to promote community development on the other,” she said.